1 Whisk vinegar, oil, chipotle chile and salt in a medium bowl. Add cabbage, carrot and cilantro; toss to combine. 2 Mash beans and avocado in another medium bowl with a potato masher or fork. Stir in cheese and onion. 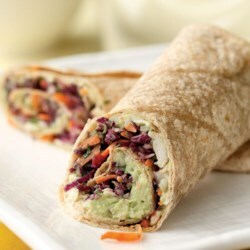 3 To assemble the wraps, spread about ½ cup of the bean-avocado mixture onto a wrap (or tortilla) and top with about ⅔ cup of the cabbage-carrot slaw. Roll up. Repeat with remaining ingredients. Cut the wraps in half to serve, if desired.